Since the distance is not too long and the fair way is relatively wide, this course is not difficult if you can control shots effectively. If you don’t hit precisely, the balls might go into the traps which are prepared splendidly, and you might end up with a bad score. Some par 3s are long, challenging and impressive. It is a great fun avoiding the big oak tree and water on the signature 16th hole. The course layout, where the green entrances are generally squeezed and many water hazards are strategically placed, is interesting and never gets mundane . A gentle uphill, slight dogleg to the left par 4. Since a 260-yards carry is required to clear the bunker at the left edge of the fairway, you should hit the center of the fairway safely. A large & deep bunker in front of the green comes into play. A demanding par 3. The long distance and the undulating green which can be as wide as 40 yards make it a really tough hole. Three putt possibilities always remain unless you are on target on the tee shot. Bunkers are well placed on both right and left front of the green. Right side off the tee is OB and bunker comes in play on the left. Accurate and long tee shot is required as the fairway is really tight on top of being well squeezed from both sides. The second shot is slight uphill, and deep bunkers are in play in the left front and the back of the green. An interesting layout with an almost 90 degree dogleg to the right off the tee followed by a slight dogleg to the right on the second shot. The overall distance will be shorter and the hole will be easier if you can make a shortcut off the tee by hitting over trees on the right. However, the high trees seldom allow the shortcut under any conditions. Since it is a long par 5 and it is difficult to hit the green in 2, the accuracy of the third approach shot is the key to success. A par 3 over water with a wide green. Although there is a decent distance between the water and the green, the rough between the green and the water is a steep. There is a high possibility the ball rolls and falls into the water if your shot is short of the green. A slight downhill on the tee shot. A big oak tree on left edge of the fairway, 185 yards in front of the green might disturb your second shot. You may feel that the green guarded by water on front looks like the 15th hole of Augusta National. Your approach shot will become a victim of the water hazard if it is short of the green even if a little. When the pin position is on the front, it will be more difficult. A slight downhill off the tee followed by a slight uphill on the second. The green is elevated and bunkers around the green raises strategic characteristics. It is a 20-muntes drive from Narita Airport. Visitors can play though Internet booking agencies. 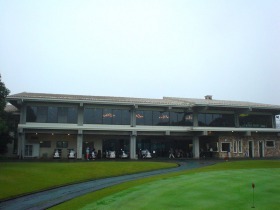 The course was awarded 93rd place out of 2400 courses in 2002’s Japanese golf course rankings sponsored by Japan Golf Classic Magazine. Within the top 100 Japanese golf course rankings, Robert Trent Jones Jr. has the second largest number, 10, followed by Siichi Inoue, 17. The third is Jack Nicklaus, 7. The fourth is Osamu Ueda, 6. The other Robert Trent Jones Jr. designed courses in Japan are Katsura GC, Golden Valley GC, Kinojo GC, Pine Lake GC, Miho GC, East Wood CC, Regus Crest GC and Cherry Hills GC.